The Loch Erisort Inn | Isle of Lewis The Loch Erisort Inn, Sheildinish. Isle of Lewis. HS2 9RA. 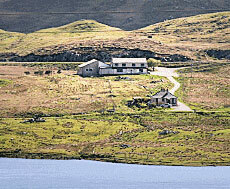 The Loch Erisort Inn is situated midway between Stornoway and Tarbert, about 1.5 miles along the B8060 at Balallan, in the Pairc area of South Lochs. Surrounded by croft land and with views over Loch Erisort, the Inn occupies a peaceful and tranquil setting, and is ideally situated for exploring both Harris and Lewis. Formerly known as the Claitair Hotel, the accommodation has recently been refurbished to provide 5 comfortable en-suite rooms, those at the rear having views over Loch Erisort and those at the front looking over the Eishken and Pairc hills. Home cooked meals using as much local produce as possible are available all day in the restaurant and there is a well stocked and lively public bar. The Inn has 5 bedrooms — 4 double or twin and one family room with double bed and bunks for two.